Nadia Khan has made a huge name for her but she doesn’t take too long attracting controversies these days. A couple of weeks ago, she had posted a no make selfie to give a positive message but people started to judge her but since it was for a good cause, she stood by it and did not remove the picture but this time she had to remove the picture she uploaded. Apparently, Nadia was asked by a fan to give her discount on her beauty services but she not only denied but also posted a screenshot of her conversation. She quickly removed the picture when it garnered enough hate. People are so ruthless that even good things let alone bad ones posted by the celebrities are given hatred. 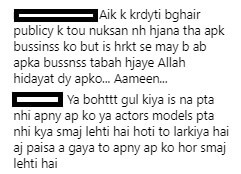 Some fans bashed her saying that she should avoid posting such private chats online as it is not fair. She was advised to ignore them. Some people were straight up cruel calling out her attitude. This isn’t for the first time that she has garnered hate or fans have reacted. Nadia is known for speaking up and supporting women otherwise. This is for the first time that she uploaded a private conversation and also criticized the person. But later she posted a video clarifying her act. She said that she deleted the photo because the girl had realized her mistake and its people who compromise their dignity by asking for such discounts.